Welcome to FLIPAGS, Former Leaders Investing for a Purpose in Aggie Gymnastics Scholars. This organization was established in 2012 as a way to give back to a program that was special to so many of us, the Texas A&M Gymnastics Club. In 2012, Andrew & Courtney Parker started with the idea to collect funds from alumni to purchase a new mini tramp for the team to use during Flips for Tips. The idea was to raise money each year to purchase equipment that the team could use. Little did we know at the end of that year a brand new facility would be in the works for the team that would be filled with new equipment. To keep with the plans of giving back, we decided to go all in and setup a scholarship. To do this we knew we would need more people to come aboard and help with the logistics. Quickly from there a scholarship committee was established that would grow into what is now FLIPAGS. Since 2013 when we gave our first scholarship we have given 20 scholarships that add up to $21,250. We are looking for more ways to contact alumni and find more ways to be able to give back. We loved being a part of the Texas A&M Gymnastics team. Training, hanging out, and competing with this group of amazing people was one of the highlights of our experiences at Texas A&M. We truly believe that this is an organization worth supporting. While we talked about it often, we did not act upon our ideas to support the team for some time. The team raises the majority of its funds. One of the major fundraisers, Flips For Tips, is run by the team before home football games. We thought a new minitramp would allow the team to perform bigger skills and maybe collect more money. A gift that would hopefully keep on giving. We contacted a bunch of alumni and they agreed the minitramp was good idea for the team. Amazingly they started sending checks. Soon we had purchased the team's new minitramp. The mini tramp before the sides were wrapped in Maroon vinyl. 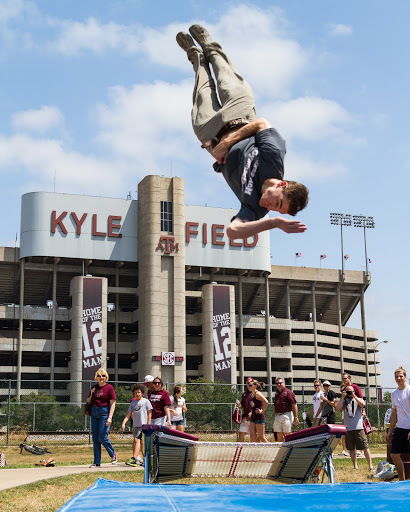 One of our former committee members, Jason Heartsfield, testing out the new Mini Tramp that was donated to the team at the A&M vs. Florida fotball game, September 2012. Little did we know that a brand new facility would be in the works for the team that would be filled with new equipment. What do you give a team with great people, great camaraderie, a great culture, and new equipment in their new gym? A scholarship. We formed a scholarship committee and again went to the alumni with open hands. The alumni responded generously. It actually worked... We had a scholarship now. We should really have a name too. FLIPAGS. Since 2013 when we gave our first scholarship we have given 20 scholarships that add up to $21,250. We are looking for more ways to contact alumni and find more ways to be able to give back.